The sequel to Sid Meier's Ace Patrol brings turn-based aerial combat to the Pacific theater of World War II. Have you been missing that "just one more turn" itch? 2K and Firaxis Games announced the launch date today for Sid Meier's Ace Patrol: Pacific Skies, a turn-based strategy game with Sid Meier himself as lead gameplay programmer. Set in World War II, the game is a sequel to Sid Meier's Ace Patrol, which was set in World War I. Players can pilot American and Japanese fighter planes and represent either the navy or the army. Missions include historic battles like Midway and Guadalcanal. New mission types have been added, like dive bombing and torpedo bombing. 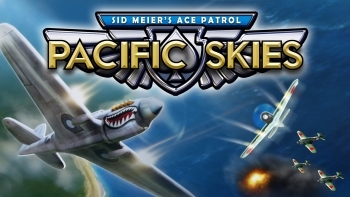 Sid Meier's Ace Patrol: Pacific Skies will be available for $4.99 USD on PC and iOS devices, launching on Steam on November 5 and two days later, November 7, in the App Store. In an interview with 148Apps, Meier stated that the AI for enemy pilots has been reworked for the sequel. "[The AI] considers the entire situation and the mission objectives before it chooses a move, so it's harder to fool than before," says Meier. When asked about the number of aircraft that will be available to pilot, Meier says, "Thirty - four each from the US Army, US Navy, Imperial Japanese Navy, and Imperial Japanese Army, as well as bombers, torpedo planes, and recon aircraft." The original game launched May 10 of this year as a free-to-play title for iOS. Extra planes and missions are available as in-app purchases. On August 27 the game came to PC via Steam, with a $9.99 price tag, now reduced to $4.99. The PC version includes all of the paid content from the iOS version, as well as some new additions and an improved in-game encyclopedia.